There’s no shortage of Italian restaurants on Yonge Street between York Mills and Lawrence. Wood burning oven pizzas, heaping bowls of pasta, and generously portioned mains are abound. Having visited a number them, my favourite (by a slight margin) is Parmigiano Trattoria, located on the south end of the strip. Their weathered looking signage and exposed brick dining room brings me back to the narrow trattorias in Italy, their homey comforting dishes even more so. 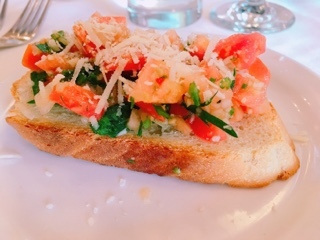 Offering a single piece of bruschetta ($1.50) is a fantastic idea, a satisfying nibble before the mains arrive without ruining the appetite. The bread is both chewy and crispy and the restaurant’s definitely not stingy on the fresh garlicky tomato topping. Their soup or salad is also a good starter. The broth of the seafood wedding soup ($7.50), a daily special, was a little weak (perhaps adding more shrimp shells to the broth would help). 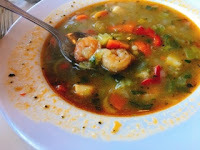 Nonetheless, it was still hearty due to the abundance of other ingredients including shrimp, bay scallops, various diced vegetables, and tiny acini de pepe pasta. For the price, the soup was a sizeable portion. 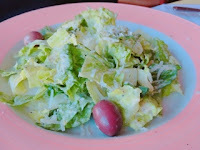 As for the salad, I love the slight horseradish kick in their Caesar ($8), it leaves an unexpected lingering as the lightly dressed garlicky lettuce disappears. You’re not going to want to fill up on starters as Parmigiano’s mains are sizeable. 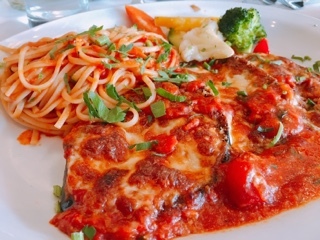 The eggplant parmesan ($16) consists of a number of deep fried slices smothered in gooey mozzarella and a flavourful thick tomato sauce. It's salty, chewy, and the edges adding a light crunch. When eggplant is this good, why do you even need meat? The dinner version arrives with a handful of crunchy vegetables and a choice of roasted potatoes or pasta. I, of course, opted for the later and the simple al dente spaghetti paired so nicely with the cheesy eggplant. The baked chicken pasta ($16.50) is an equally hefty portion. 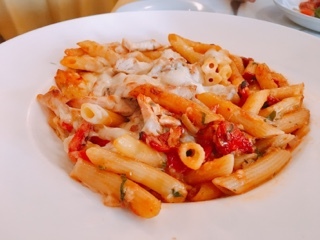 The penne is done well and arrives piping hot mixed with chunks of chicken, roasted peppers, and sundried tomatoes. Dig to the bottom of the dish where you’ll find the creamy tomato sauce accumulates, whereas bites from the top are greeted with mostly cheese. Even their pizzas can be shared. 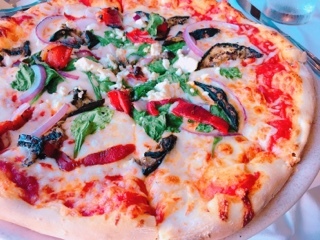 Try as I might, I couldn’t finish the Mediterranean ($16), its thin crust topped with a variety of vegetables (eggplant, roasted red pepper, red onion, spinach), mozzarella, and goat cheese. With the sheer amount of ingredients and adequate sauce, the crust does get soft in the middle, but there's still a chewiness to the dough and the flavours make up for it. 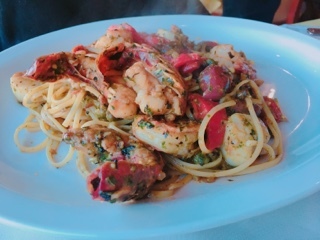 While the seafood pesto pasta ($32) is pricier compared to other pastas, the restaurant doesn’t skimp on the shrimp, scallop, and mini lobster tails … the pasta to seafood ratio was equal! The special for the evening was described as incorporating pesto, capers, and olives (all stronger ingredients); even so, the flavours weren’t overwhelming and combined nicely with the citrus. Make sure to save room for desserts, their homemade selection had us finishing every forkful despite being stuffed. 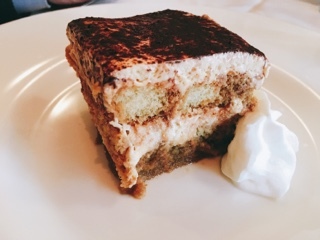 Parmigiano’s tiramisu ($7) has a strong hit of marsala wine and actually incorporates zabaglione, a spiked custard layer; too often places simply rely on plain espresso to combat the sweet creamy mascarpone, the rich zabaglione really helps add an extra depth to the cake. 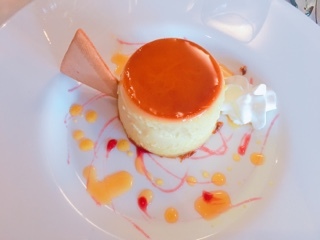 The height of the crème caramel ($6) is astounding. Its consistency is creamier and fluffier than what I’ve previously tasted, it seems like there’s less gelatin and more egg in their version. 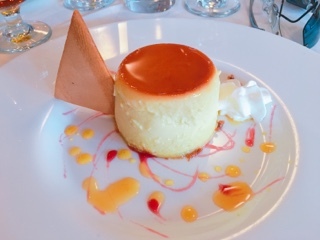 Rich and luscious the dessert is like indulging in a crème caramel cheesecake (without the cheese). Even the crisp triangular cookie on top is good, I ate every crumb. When I’m craving Italian, Parmigano is one of my go-to restaurants in the neighbourhood. From the bruschetta to eggplant parmesan and ending with a crème caramel, a delicious carb-filled journey across the Italian cuisine landscape.